The Kimberly Clark SafeSkin 12" Nitrile Glove product family offers a comprehensive line of non-sterile and sterile gloves. The SafeSkin 12" Nitrile Gloves were designed as an alternative for those who may have a Type 1 hypersensitivity to natural rubber latex proteins. 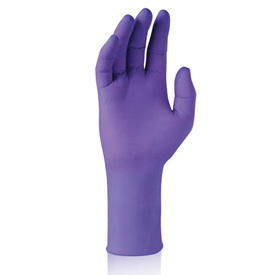 The unique COLOR of the nitrile glove is PURPLE* this helps provides quick, visual differentiation from latex and other synthetic gloves. Kimberly Clark SafeSkin custom design enhances comfort and fit, and textured fingertips improve wet and dry grip. 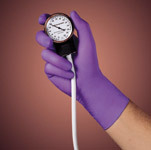 Rated one of the 3 best nitrile gloves on the market. The quallity and comfort of this glove is one of the best on the market today. It comes in Sizes Small Medium Large and Ex-Large. Click below to order.